today was the north american release date for the new los campesinos! album "romance is boring". i resisted listening to any of the leaks online. i love this band blindly; i would buy anything they release. so i went to hmv after having lunch with my friend. the cover art is boring, but this music is so much fun to listen to. i've been listening to some electro lately. 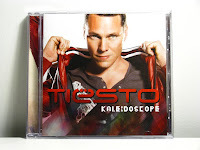 today, i got tiësto's recent release "kaleidoscope". i love that the collaborators on this release are not usually associated with the electro genre, which makes the resultant tracks interesting. i had only heard about vampire weekend from the many mentions on pitchfork. but i had not checked out their music, until rox wrote about their song "horcata". and yeah, it's a damn catchy song. their album "contra" was released this week. i got it after school today. it came with a bonus "contra megamelt" cd. i'm not sure how to describe this album. for some reason, it makes me think of a lazy day at the beach. which is what i need now, in this cold and grey winter season. first cd purchase of the year! yesterday, the new final fantasy/owen pallett album "heartland" was released. i got it on my way back home. i love the simplicity of the front and back covers. unfortunately, i haven't had the chance to listen to this too much. been too busy with school work (i.e., i procrastinated all week, and now i need to prepare for my meeting with my advisor tomorrow). i've had overflow for a while, so i finally got additional storage for my cd's.